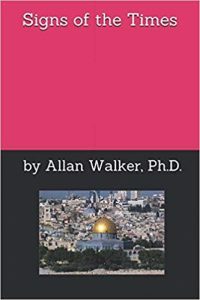 This book by Dr. Allan Walker is truly a volume that brings into focus exactly where we as a generation stand on God’s Prophetic Timeline. People today are woefully lacking in being able to understand where the cascading evil is leading. The time is drawing very near that God must Judge a wicked, rebellious world. Even Christ’s Body – the Church – seems, as a whole, oblivious to just how near Christ’s Call “Come up hither!” (Rev 4:1) might be. The forewarnings are not being issued by many pastors and teachers. Christians are concentrating on the daily cares of life. All of this is, itself, a signal that the end of the Age of Grace is drawing to a close. In Matthew 16:1-3, Jesus told the religious people of His day they could discern the face of the sky but could not discern the “Signs of the Times.” It was their ignorance of the prophetic scriptures, along with hardness of heart, which caused them to miss the significance of the one who stood in their midst. Daniel 9:25 had predicted the coming of the Messiah down to the exact day. Scripture contains 109 specific prophecies from the Old Testament which were literally fulfilled during Christ’s first coming. “The revelation of the second coming of Christ is one of the most important and most frequently mentioned doctrines of the New Testament. One out of every twenty-five verses in the New Testament refers either to the rapture of the church or to Christ’s coming to reign over the world. Current events are fitting into the precise pattern outlined by the prophets of the Bible. Signs of the Times compares scripture with the news events of our time and presents compelling evidence that we are living in the last days. The prophetic scriptures outline in detail a pattern of events which will transpire in the final generation. Four spheres of geopolitical power will be dominant in the tribulation period. Those are generally believed to be Russia, China, the EU, and the Islamic nations surrounding the modern state of Israel. In the generation following 1948, we find Israel back in her homeland surrounded by hostile Islamic countries intent on “wiping Israel off the map.” In addition, we see a convergence of many end-time prophecies including apostasy in Christendom, a resurgence of occult practices, an increase in knowledge and travel, worldwide preaching of the gospel, and many more which are clearly documented in Signs of the Times. The central point of this book is to make the case that we are living in the last days. Christians should be up and about the Master’s business. Unbelievers should seriously consider the claims of Christ and receive Him as Lord and Savior while time remains. I find Signs of the Times one of the most important of the Bible prophecy books currently on the market. Get this one, folks. You won’t be disappointed. Signs of the Times is available on Amazon in both eBook ($7.99) and paperback ($14.99). Also, Allan Walker gives PowerPoint presentations outlining the prophecies of Signs of the Times and other topics in churches and seminars across the country. Please contact the ministry to schedule a presentation. OAC says Where’s Mitch? How About Where’s RBG? :: By Vanessa P.